Dmitri Shostakovich (1906 – 1975) is primarily known as the greatest composer born in the 20th century; though he started out as a pianist. He largely gave up playing to concentrate on composing when he was very young. But later in life he did occasionally perform as piano soloist, though only playing his own compositions. 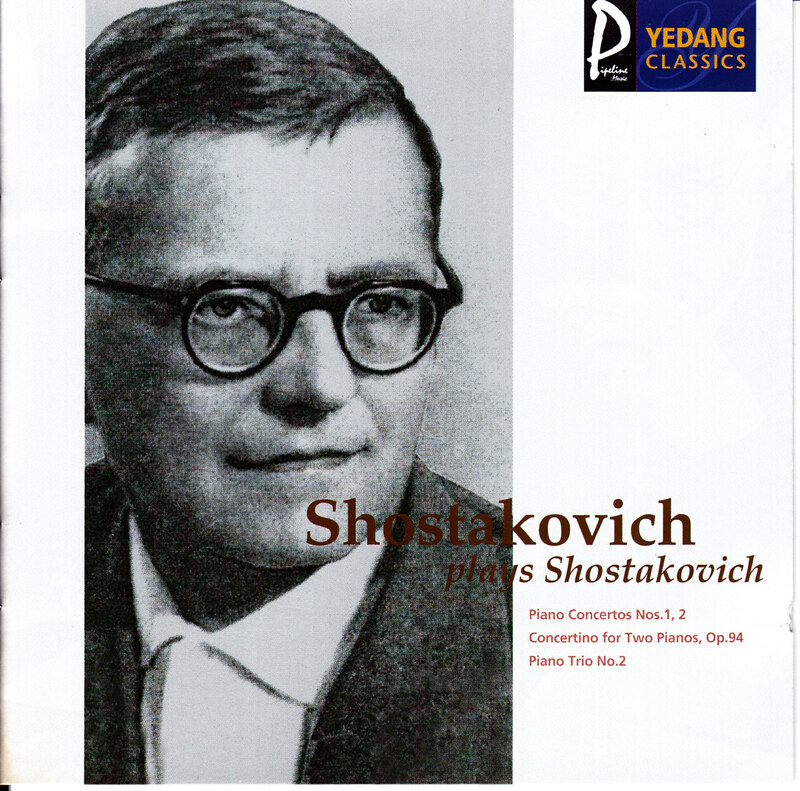 The current Recording of the Week features Shostakovich playing four of his works: The Piano Concertos 1 & 2, the Concertino For Two Pianos, and The Piano Trio #2. If you know these pieces, you’ll be amazed by their compser’s interpretation of them as well as by his dazzling virtuosity. What’s most striking about these performances is their tempos. They’re about twice as fast as anybody else’s. How a part time pianist can play this fast is amazing. Shostakovich must regularly have taken time out from composing to practice to be able to play at this level. Other performers should listen to these performances and rethink how they approach the concertos. In his hands the two concertos, often thought of as light pieces, take on a gravity not realized by other pianists. These recording, all made in Moscow, date from 1956, 1959, 1956, and 1947 – the order is as given above. Yedang Classics is not a household name, but if you can find this recording I highly recommend it. Shostakovich recorded the concertos in Paris under André Cluytens and while the sound and orchestral playing is better than on the Russian version the piano playing is much more exciting in its Slavic incantation. Below are the finale of the last movement of the first concerto and all of the last movement of the second concerto. It’s obvious that Shostakovich could have made a career as a pianist, as did Rachmaninoff and Prokofiev, had he wished to. Also note that the microphone is placed so near the piano that it often drowns out the orchestra. After listening to these excerpts you’ll doubtless storm out of your house to capture City Hall. The trumpeter in the first concerto is Josif Volovnik. The other pianist in the concertino is the composer’s son Maxim. The great violinist David Oistrakh and cellist Milos Sadlo join Shostakovich in the trio. “The Red Baton” is a fascinating documentary on the total state control of music under the Soviets. Dissonance was forbidden. Stalin dictated that music must be happy. Minor seconds & sevenths forbidden. Some of the bureaucrats in control knew nothing of music.